On the back of the photo, in my mother's handwriting, is "Lorrie's 9th birthday." 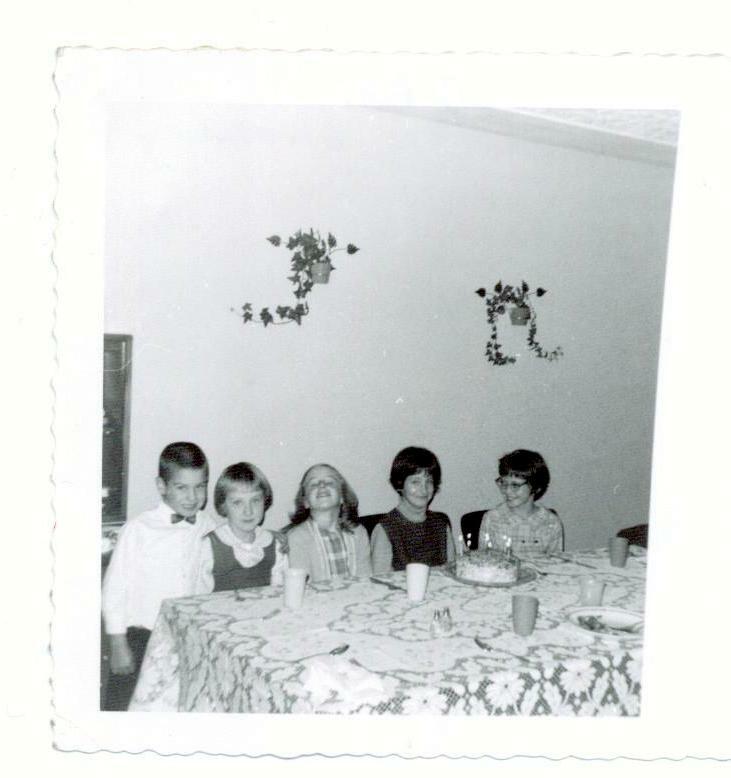 I'm sitting behind the cake, flanked by two childhood friends, Gail Rainey on my right, tossing her hair back, and Carol Rempel on my left, wearing glasses. Rounding out the photo - my sister and brother. My parents always made our birthdays special. We didn't have fancy parties, but always a few friends, presents, and a dinner made with particular care. My mother baked a cake and topped it with her 7-minute frosting and candles. Birthdays were fun days to anticipate. One year, probably my 10th or 11th birthday, I went to school and felt shunned by my friends. They whispered among themselves, giggling as they turned away from me. I was hurt and stormed home from school in a huff, thoroughly upset. Later, not long before dinner, the doorbell rang and my mother suggested I answer it. There stood my friends, ready for a surprise party. I remember feeling a bit resentful even then, hurt by feeling left out. But it soon passed. While living in Ecuador, away from family in a remote setting, with small children, I learned that it was just fine to make my day special in my own way. I would take some time to do what I wanted, such as to sew or read. I would save a magazine for that day, or make something special to eat. Relying on others to make my day special, without communicating what that might look like, just didn't work. Lighting candles, opening a new bar of rose-scented soap, wearing a favourite outfit - these are the little things I do to mark my birthday. Today is another birthday. I'll be at school and the day will pass quietly. But Tim and I will have dinner together at home, I have a selection of cards to open, a present that arrived in the mail, and the delight of future celebrations with family on the weekend. How about you? How do you celebrate your birthday? Happy Birthday, Sweet Lady! Lorrie, you really haven't changed much since your nine-year old self. So cute! I celebrate my birthday as quietly as possible. If my family is able to join me on an evening ahead or after that is lovely. It's not often on "the day." And poor John never remembers or he hasn't remembered yet. Ha! This was such a sweet entry! I too learned long ago that it is wonderful when people remember our birthdays but... life is so busy and it's hard for others to remember all the special dates. To celebrate having been given life with a new magazine or a walk - really marks the anniversary so nicely. And when people do remember... well that is just extra nice! PS Be sure to enter my GIVE-A-WAY! Happy Birthday. When I was eighteen, I had a union position and part of the contract was to have your birthday off. It started a trend for me. Since then I always do something I want to do on my birthday. I make the day special in personal ways although not totally without other people. I remind my family and tell them what I'd like but I don't wait expectantly for them to make the day happen and then feel devastated when it doesn't. That's a waste of a great birthday. You and I are an awful lot alike in this way. I like to treat myself on my birthday - even go away for the day with The Great Dane. I think I'd be traumatized by a surprise party, even now. Love that old photo - you look very composed, even at nine! I celebrate my birthday alone this year, as the children were somewhere else. No cake, no special dinner, and just quiet time with the Lord! Happy birthday, dear Lorrie! I hope that your birthday has some delightful surprises and memory-making moments...and an upcoming year rich with blessings from His hand! We tend to stretch birthday celebrating over several days in our family. Having a large(ish) extended family, all of whom love to celebrate birthdays, usually means a Sunday afternoon party in addition to whatever the birthday person has chosen to do on his/her day. The picture you shared is precious! Happy Birthday, Lorrie. I hope you feel treasured and blessed on yor special day. I enjoyed your little walk down memory lane. happy birthday! There are things that will make this day special to you (love to unwrap packages that come in the mail) and you have more to look forward to this weekend! Happy birthday! Each year is a gift and the party is what happens in between each birthday! Hope that you've had a really special day Lorrie. It is nice to make the day different in some way- perhaps trying a new flavour of tea to sip while a new book or magazine is enjoyed. The thing I look forward to most are just hearing the voices at the other end of the telephone line. I love getting calls - especially on my birthday! That's a great birthday party snap! Happy Birthday! Blessings to youon your special day! I had a very similar surprise party happen to me over my 13th birthday. I vowed to never do that to my kids. My mom was well intentioned, so I never got upset with her. You asked what we do to celebrate our birthdays... I enjoy time with family and some times friends. My mom takes me shopping for my gift and then I do the same for her 3 months later. It's a tradition we've both enjoyed over the years. I'm sorry I missed your birthday but belated greetings are being sent from Nebraska, USA!! The photo is very sweet and I felt bad for you for your "surprise" birthday years back. I'm not much of a surprise party person and this may explain why. I think anticipation of a party is as important as the event sometimes. And, feelings of being left out, well that certainly take time to heal from. What a blessing that you learned to celebrate your day on your own. Because God would want each of His children to feel how special the day they were born was to Him. Belated birthday greetings to you Lorrie. That old black and white photo brings back memories of scenes from my early days, too. I'm glad you really weren't being shunned at school all though at the time you felt it. These days we go with the flow for birthdays. Generally no surprises, although for my 60th bash my kids managed to thoroughly surprise me with a limo to take us all to dinner. Right now I'm organizing a party for my parents 90th year in the Spring. Happy belated birthday! Loved this post..... it takes awhile to gain that wisdom (for most people).... that you can't rely on others to make you happy. I don't have a set plan on my birthday.... but I do treat myself well! ha! I'll celebrate my birthday next week -- perhaps not on the day itself (I expect to work a late shift) but shortly thereafter. It will be my first birthday since 2003 in the presence of family. Like you, I wear favorite clothes on my birthday. More weirdly, I pray for cloudy weather. Most years, that prayer is granted. Happy Birth Week! It is fun to see the birthday picture from the past. My first birthday party ever was a surprise one that a friend gave me at her house when I turned 12. Well, it was *supposed* to be a surprise but I figured it out beforehand. I thought it strange that my girlfriend was talking to my mother at length on the phone so I eavesdropped. But I never told anyone that I knew, and it was a lovely party. I remember the dress I wore, and the 6-layer cake that was in my honor. I'm glad that these days you are a good friend to yourself on your birthdays!